It’s summer and the travel season officially begins. Sometimes staying healthy when you are traveling is tough. So today, we have 2 guests who will tell us exactly how to stay as healthy as possible, even when you travel. Nicholas and Amanda Bayerle are health coaches and they are here to help us prepare for summer vacation. How do you stay healthy when you are traveling? How do you keep up your exercise routine while you are traveling? Figuring out the best time of day to get your workout in before you start planning your day. Sometimes, first thing in the morning is best before your day gets crazy. Using body resistance workouts will allow you to continue to workout with no equipment. You may not have a gym or exercise equipment, so body resistance workouts will always be available. You can do resistance training in a circuit – upper body, mid-body and lower body workout will give you a complete workout. Even if all you can do is walk, then make sure you do that. It’s important to remember that 70% of the results you get is a result of what you eat. How do you stay on a program when others around you aren’t? Have an accountability partner that can help hold you accountable. If you have a favorite meal, then plan one indulgent meal and let that be it. Jump right back on healthy eating. It’s better to not deprive yourself for so long that you actually binge for an entire month because you have felt so deprived. How do you keep a steady sleep schedule when you are traveling to different time zones? Keep a regular sleep routine. Prepare your brain to go to bed. No electronics 2 hours before bed time. When you have a sleep preparation routine, your brain will begin to prepare for sleep in spite of what time it is. How do you keep from having negative thought patterns when you are on vacation? You want to keep from sabotaging yourself. You want to stay focused on your goal. Get in the right mindset, and understand the consequences of the bad food that you may eat. You may not feel well if you splurge too much. Then you may pile on the negative self-talk and spiral into a slump. Nicholas and Amanda Bayerle are hosts of the How Bad Do I Want It? Podcast. They tell stories of successful entrepreneurs that had a dream and follow it to create an amazing life. They interview people who are in the wellness space because they believe that making a healthy lifestyle change can indeed change your life. 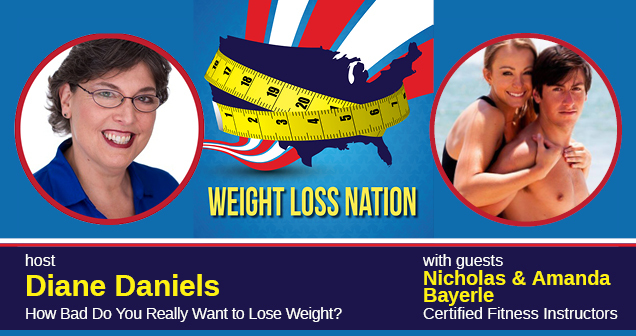 Nicholas and Amanda also have a health coaching business and they can be a resource after you complete the 90 day Weight Loss Nation Challenge! www.thetruechallenge.com/webinar – Get the Free gift of Think and Grow Fit to show you how to stay fit – it’s a $30 value and free to you.